When I purchased the Tusked Negrito mask (post of August 13, 2018) from the Tesoros Trading Company in Austin Texas, I also obtained two other masks there that appeared to be from the Sierra Juárez area of the Mexican state of Oaxaca, but obviously from other dances. Both had neck straps, one held by a metal staple and the other threaded through a hole in the chin. Since then I have also acquired two other masks, which appeared to be Cubano masks (Negrito masks that lack tusks), from the same region. Today we will examine those four masks, beginning with the Cubanos. I have introduced you to Barbara Mauldin’s book—Masks of Mexico: Tigers, Devils, and the Dance of Life. On page 66 (the page facing the one about Tusked Negritos) there is a dance photo of the Cubanos dancers taken in 1964 in Tamazulapan, Oaxaca, wearing the same sort of elaborate costumes that are worn by the Tusked Negrito figures. 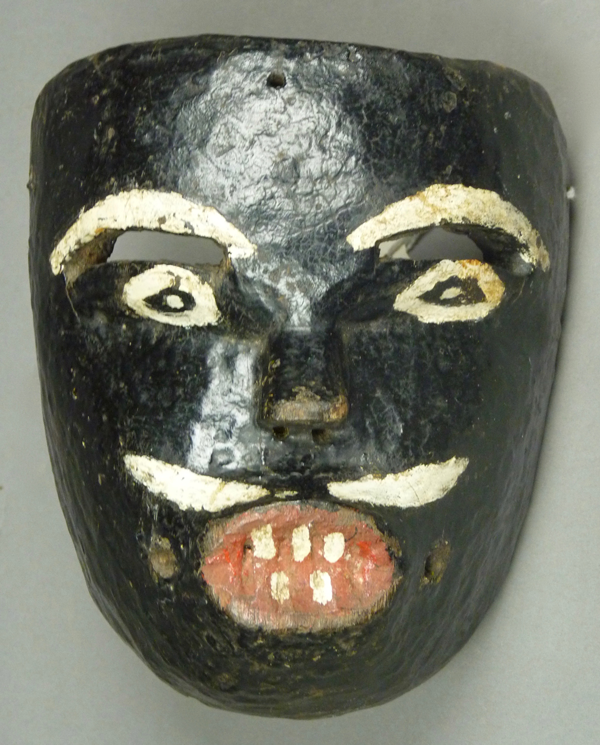 There is also a photo of a Cubano (or Mulatto) mask from the collection of the Museum of International Folk Art. As you saw in recent posts, there are Negrito masks in the Sierra region that have snouts and tusks, and others which lack these features. It is the latter group that have sometimes been called Mulattos or Cubanos. 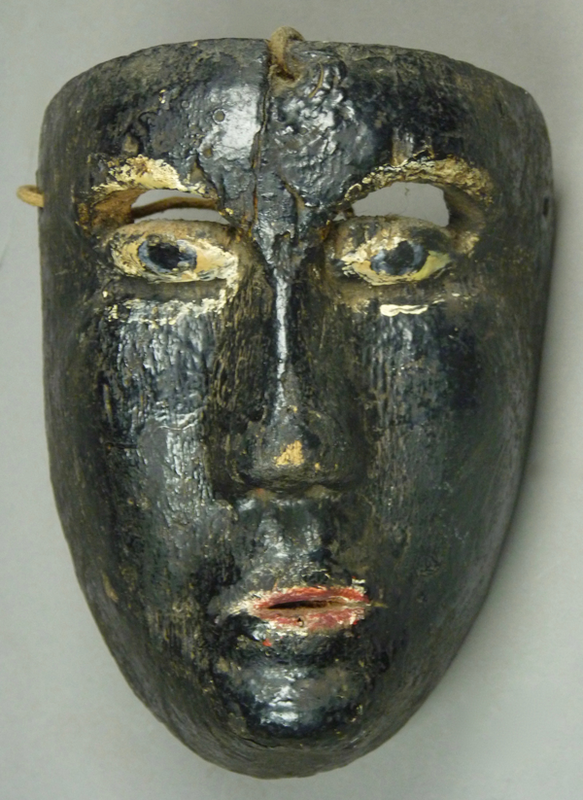 Currently these masks have black complexions, although they may have been brown or black in the past. 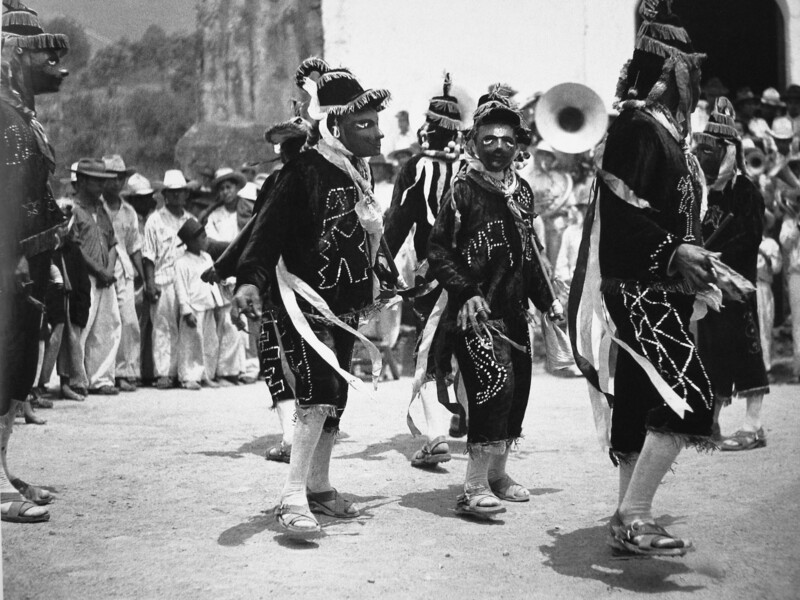 Here is a link to an old photo from Tehantepec, Oaxaca, followed by a YouTube™ video of a Negritos (or Cubanos) dance group from Yalalag, Oaxaca. And here is a Cubano mask from this region that I purchased from Bob Ibold in 2004. It appears to have great age. This is such a simple mask, and at the same time, such a superb old mask. 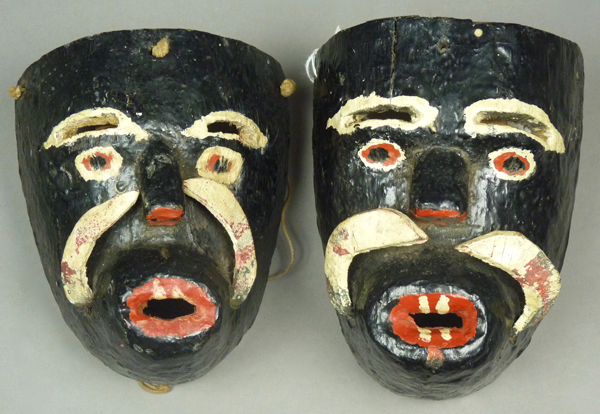 Today I will begin with two paper masks from my collection, a favorite pair that I purchased years ago from a Saturday Market held weekly at the Plaza del Angel in the Zona Rosa, Mexico City. 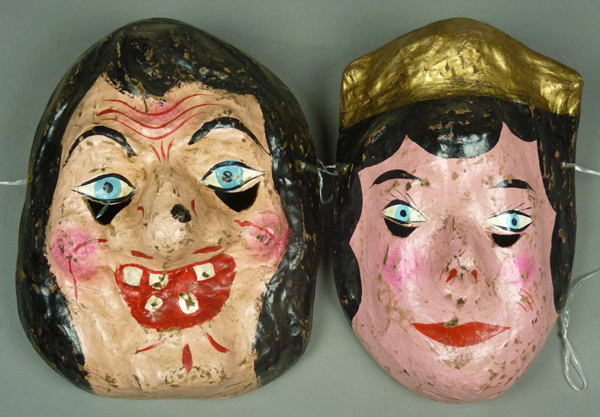 These two appear to depict story book figures, such as a Queen and a Witch. Here they are, photographed together.